Makeup Geek eyeshadows are undoubtably the best eyeshadows I have ever tried. They are buttery, easy to blend and ridiculously pigmented. What more could a girl want?! Plus, the shade range is absolutely gorgeous. Above are the shades I have so far, but I definitely have my eye on a lot more. The concept of building an eyeshadow collection is so satisfying to me and I can’t wait to do more posts like this once I have collected more. I store them in a large Z palette but also have a medium Z palette to use when I travel. So without further ado, here are the shades I have in my collection so far. Shimma Shimma is a gorgeous light beige shimmer and let me tell you it is SO pigmented. It is one of my most worn shades as it is so perfect for all over the lid, but also in the inner corner and on the brow bone to highlight. Starry Eyed is one of Makeup Geek’s foiled eyeshadows. The foiled shadows are even more pigmented than the regular line and are packed full of gorgeous finely milled shimmer. Anyway, this shade is a gorgeous champagne shimmer. It is absolutely perfect for day or night, but can be packed on a lot more during the evening to really make the eyes pop. Beaches and Cream is a light creamy beige matte shade which is similar to my own skin tone, but a little warmer. This one makes a perfect transition shade and base for prepping for darker eyeshadows. Creme Brûlée is similar to Beaches and Cream, but is slightly darker and warmer. This is another great matte transition shade for adding that first bit of warmth into the crease. Frappe is a warm toned matte mid-brown which is perfect for warming up the crease. Grandstand is another one of the foiled eyeshadows and it’s one of my favourites. It is a warm brown with hint of rose gold to it. It’s just absolutely stunning and is great for a more glam makeup look. Cosmopolitan is the most beautiful peachy pink rose gold shimmer. It has so many gorgeous tones in it which warm up the eyes instantly. Cocoa Bear is a warm matte brown with a red undertone. This shade is great when you want to really deepen up the crease to create a warm toned eyeshadow look. I personally think this shade looks gorgeous on people with blue and green eyes, as the red tones really makes these eye colours pop. Barcelona Beach is a light matte brown with a cooler undertone than its counterparts Beaches and Cream and Creme Brûlée. This one is great for toning down vibrant warm colours or just for creating a soft and simple crease look. It also works well to warm up even more cooler toned browns, as Barcelona Beach is a nice middle of the road cool tone. Cinderella is probably my least favourite shade within the palette, and a shade that I sadly do not really use. The pigmentation of this shade is just so off. I can never get enough product onto my brush and therefore onto my lid. The colour in the pan is stunning (a shimmery light pink) so it’s a real shame that it just doesn’t look the same on the eyes. I haven’t had this problem with any other shade so I’m not really sure what went wrong when making Cinderella! Petal Pusher is a gorgeous matte rosy pink shade that is perfect for creating a warm pink toned eyeshadow look. It goes great when layered with Barcelona Beach as you can create that perfect pink toned brown shade that just looks good on anyone. Tuscan Sun is a stunning warm pink shade which I absolutely adore. I bought this shade on a whim but I am so glad I now have it in my collection. Perfect for creating that sunset effect on the eye. Brownie Points is a dark cool-toned matte brown. I don’t really use this shade that much, but it’s great for adding depth to the crease within a more smokey eye look. Prom Night is a cool-toned shimmery taupe with grey/purple undertones. Again, I don’t tend to go for cool-toned looks as often so I don’t reach for this one that much. Mesmerised is another foiled shadow, which is a deep purple shade with taupe undertones. This shade is so pretty for a night out. I definitely need to reach for it more! And because it’s a foiled shadow, the pigmentation really packs a punch when creating a purple smokey eye. Bitten is a deep purple/burgundy matte shade. This one is great for smoking up the crease and outer corner when creating a purple/pink eye look. I love this shade, especially for a night out. It goes amazingly with Mesmerised too! Yes, I’m that much of an addict that my collection has grown since taking the photo for this post. I was so happy with this photo that I couldn’t bare trying to recreate it! Nostalgic is a foiled shadow. It’s a light pearly pink shade, which is described as ‘bubblegum pink’ by Makeup Geek. I do like this shade, but I do have to work quite hard with it and layer it up. It’s not quite as buttery and smooth as my other foiled shadows, however I still really enjoy using this. Wild West is a gorgeous deep pink/rose toned brown shade. I wanted this shade for so long, so I’m so happy to have it in my collection! It warms up any look and goes with a lot of different shadows, which is great. It’s also really easy to build up if you want a more intense colour pay off. Mai Tai is a duochrome shade. It’s a peachy pink shade with a vibrant pink/purple shimmer. I can’t get over how stunning this shade is. When used with a good eyeshadow primer, it makes the eyes pop. I can’t wait to use this shade more in the summer. The colours just remind me of holidays and cocktails! Blacklight is another duochrome shade, which is a little different for me. It’s a purple shade with a light blue shimmer. I’m actually yet to use this, but I really want to have a play around and try this out. I might have to watch a few YouTube videos to see how I can make this work. 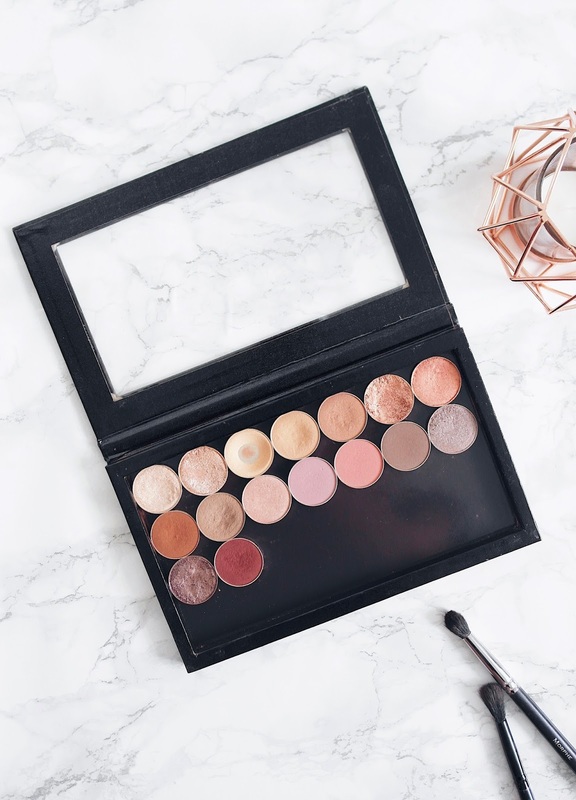 Do you have a Makeup Geek eyeshadow collection? What are your favourite shades?